Yesterday I was able to visit the Edinburgh tomb of Lt. John Irving, RN, of the Franklin Expedition. As many people will be aware this tomb contains the remains of an officer of the Franklin Expedition buried on King William Island, which were discovered by Lt. Schwatka. On the basis of a medal found associated with the grave, the remains were identified as those of Lt Irving. Were they really Irving's bones? Who knows, but it was a privilege for me to see this beautiful Celtic cross in the immaculately maintained Dean's Cemetery in Edinburgh. In memory of Lt. John Irving, RN. HM Ship Terror. Born 1815. Died in King William's Land 1848-9. Her Majesty's Ships Erebus and Terror left England in May 1845 under command of Sir John Franklin KCB to explore a North West Passage to the Pacific. [Note the 'a', not 'the'] After wintering 1845-6 at Beechey Island they sailed south down Franklin's Strait and entered the NW Passage. Having been there beset with ice for two years Sir J Franklin and 8 other officers and 15 seamen having died the survivors 105 in number Lt. Irving being one landed on King William's Land and attempted to march to Canada but all died from cold and want of food. In 1879 Lt. Schwatka of the American searching expedition discovered Lt. Irving's grave. Through his kindness the remains of this brave and good officer were brought away and were deposited here on 7th January, 1881." Below it is the quotation from the Bible - Romans 8:35 - "Who shall separate us from the love of Christ?" St. Paul went on to write: "Shall tribulation, or distress, or persecution, or famine, or nakedness, or danger, or sword?". The answer presumably was - no. In turn below that is the the famous wording from Horace, Odes III, 2, 13, which chillingly was used by Wilfred Owen for the title of of one of his most moving poems "Decorum est pro patria mori" - it is right to die for one's country. One wonders whether Owen was aware of this use of the quotation when he chose it as the title of his poem. 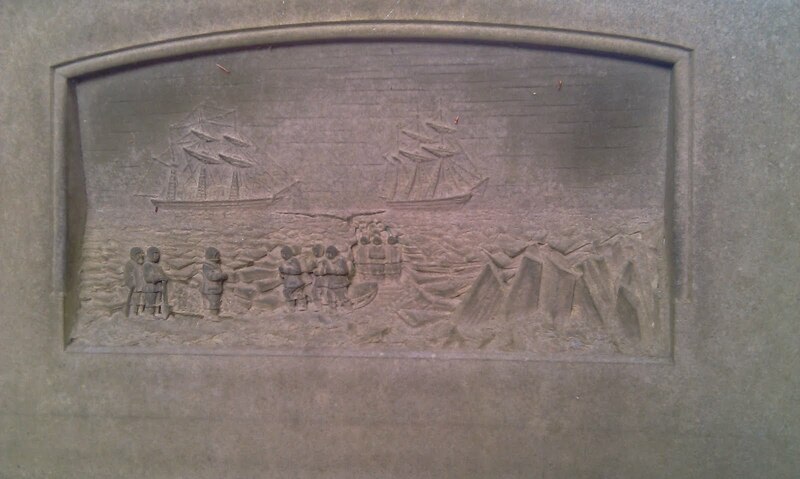 And finally, there is an attractive bas relief showing the imaginary scene of the burial of Irving on King William Island. In the background can be seen the two ships Erebus and Terror. This does look rather similar to the bas relief on the Franklin Memorial in Waterloo Place, London, except without the more absurd fantasies of that one - no mountainous icebergs. And on Irving's tomb the mourners are shown holding nothing more unorthodox than a spade. Of course in reality I am not sure how much use a spade would have been for a gravedigger on King William Island - but at least the mourning sailors are not clutching bows and arrows as they appear to be in Waterloo Place! 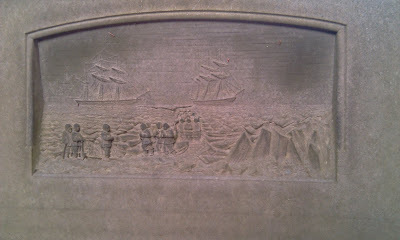 The bas relief is till in very good condition. Of course when I spent my time before this cross I had two very different emotions. The historian in me mourned the loss of the young man buried below, and appreciated the quiet dignity of the tomb erected over him. But the archaeologist in me started to obsess about the potential for forensic evidence that was below my feet. Should we try to disinter these remains and see whether modern forensic research could find out more about this man and his unhappy death? Who knows? Thanks for posting this. I am planning a trip to Edinburgh in September and will make a point of visiting the memorial. Incidentally, do you have firmed up launch date plans for Toronto? i'm looking forward to it and I'd hate to be travelling in opposite directions and miss it! Hi Ted thanks. If you could get in touch and let me know when you are over in the UK I could arrange for you to see a few interesting things. How about the ships' Muster Books, which were sent back from Disko Bay in the Baretto Junior and are now in the National Archive? I haven't finalised plans for Canada yet, but again would appreciate an opportunity to get some ideas from you. I don;t know whether you can get me an email via blogger but if not I'm william [AT] battersbyfamily [DOT] com. As a young(ish) and fairly recent Franklin follower, I am absolutely thrilled to have stumbled across your blog, and also the blog of Mr. Potter. Stuck in New York due to family and job situations, I cannot travel to London and Canada and all the other wonderful places containing Franklin relics and related papers. I have learned more through your blog(s), reading through the entire contents in the last two days, than I have in the past 3 years. Please keep up the good work! The informative informational pieces, and even your conjecture as to who was alive when and why fascinate me beyond belief, and add greatly to my limited knowledge. 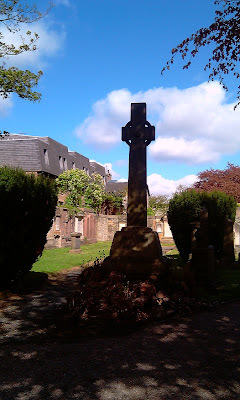 William, a lovely post, and a great description of the present state of the Irving memorial. And, as much as my curiosity drives me, the sight of the grave gives me pause; what could we learn, even were we to discover that the remains were those of someone else? Would it be worth disturbing the peace of those bones? Both sides of the silver medal concerned are shown above the bas relief, and one assumes its details were faithfully executed in stone. The obverse of the actual medal features a profile of the King, surrounded by "Georgius IIII D.G. Britanniarum Rex/1820". On the reverse is a laurel wreath surrounded by "Second Mathematical Prize/Royal Naval College" and inside engraved in script is "Awarded/to/John Irving/Midsummer/1830". Images of the medal appear on the frontispiece of an 1881 memorial sketch to Lieut. Irving.